One of the key things to consider when buying a sewing machine is the number of stitches that are available. Standard stitches include straight stitch, zigzag stitch, buttonholes and blind hem stitch. However these are pretty basic stitches and may not be sufficient for all sewists. You may decide to start out with a basic machine and upgrade later once you have worked out what you want to sew. The other decision is to have a think about what you are likely to sew and if this will change in the future. 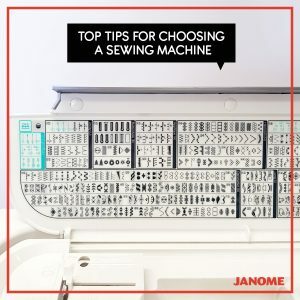 If you already know the projects you’ll be working on or have a general idea of which stitches you would like and need, then this can be a simple starting point for selecting a machine. 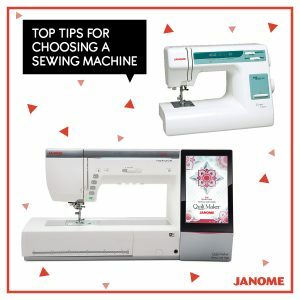 It is usually recommended if you are unsure of what to buy that you look at a sewing machine that can cater for later on as your skills and experience expand and evolve – you will thank yourself for that later! While both types of machines perform the basic task of making uniformed stitches, factors such as skill level, needs and budget will influence which machine is more suited for you. With computerised models, you get additional features and extras that can save you time and enhance your sewing experience. Attachments and feet will be specific to what you plan to sew. Quilters will want a walking foot, free motion foot, and a 1/4″ foot. Garment sewists may look for a zipper foot, overcast stitching foot, buttonhole foot, and button attaching foot. 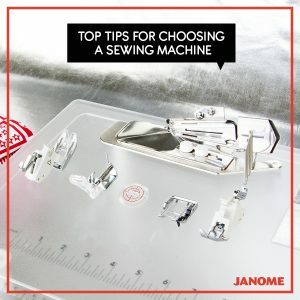 Many machines may come with all of these feet, however, they are also available as optional accessories within the Janome range of genuine parts and accessories. • Automatic Thread Cutter: Push a button to cut the thread. Once you start using it, it turns into a “must have” feature. • Foot Pressure: Allows you to adjust the pressure that is applied to your fabric while it is moving under your sewing foot. • Knee Lifter: Allows you to lift the presser foot while your hands are holding the fabric in place. Ideal for curves and sharp corners. 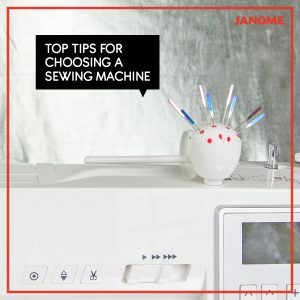 • Janome AcuFeed™ System: Top and bottom feed dog system makes it a breeze to sew through multiple layers and heavy fabric. Highly recommended for quilters or working with multiple layers. • Wi-Fi capability: You can easily send embroidery designs from an iPad or computer straight to the machine. What are some of your favourite features?